In the era of All Things Mobility, where both carmakers and tech startups are clamoring for a piece of the ride-hailing pie, it seems like everyone is convinced that fetching a car on demand is the future of the car itself. But in a scenario with rising gas prices, and a crowded field, can all of these companies co-exist? We’re in a situation where car sales are in a sustained decline, the business model for ride-sharing is at best tenuous in terms of cost vs. profitability, and the number of players trying to get in on the action has continued to tick upward. Everyone’s doing it. Uber, Lyft, General Motors, Ford, BMW, Daimler, even Tesla now, plus countless other smaller ride-hailing startups. Oh, and many of these, if not all of them, either want or are banking on driverless cars to make it happen. A lot of people think that once you make cars autonomous that they’ll be able to go faster and that will alleviate congestion and to some degree that will be true. But once you have shared autonomy where it’s much cheaper to go by car. And you can go point to point. The affordability of going in a car will be better than that of a bus. Like, it would cost less than a bus ticket. For Musk and his fleet of driverless cars, maybe this is in the realm of possibility. Great for him. But for the remaining services that rely on a human being to move folks about, this seems like quite a charitable read of the situation. Some analysts have already forecast that oil prices will rise throughout the year. Let’s say there’s a hypothetical situation where there becomes a trend and gas climbs to $4 per gallon on average. Crazy, right? The cost-benefit analysis between ride-hailing and owning a car may lean toward the former, in some places, for now. But if gas prices screw with the overhead for drivers and the cost for passengers, the entire equation suddenly appears lopsided. Is the Uber driver in Detroit who’s earning just under $9 per hour really going to stick with the company and deal with the extra costs for gas and the continued wear and tear on their vehicle? How about the Uber and Lyft drivers who’re already struggling to pay the subprime loan for a vehicle they leased to work for either company? What if Gett, Via, Curb, or Ford’s Chariot expand into areas where Uber and Lyft already have a strong presence? How will that impact demand? If gas prices indeed jump, and these service shave to raise ride prices to compensate for the increase, are passengers still going to rely on them? In the current environment of growing uncertainty, the ride-hailing service growth seems more like a big gamble than a solid proposition. Especially when no one’s cracked how to net a sustained profit yet. 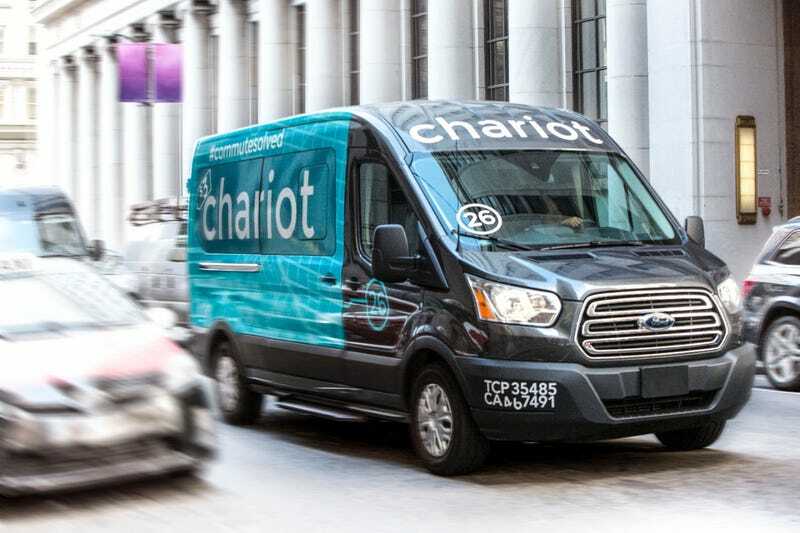 Ford and other see the beginning of the next decade as a time when fully autonomous cars can operate in a geo-fenced area, like a confined downtown business district, for ride-hailing purposes—similar to what Musk is pitching for Tesla Network. That seems to be what Waymo is piecing together with its partnership with Fiat Chrysler; the Google self-driving car project announced last week that’s it’s rolling out the largest autonomous fleet for testing purposes in Phoneix. But if Uber’s model—subsidize ride costs using private capital to create a super low fare—is the way forward, then it seems most likely that we’re barreling toward a situation where each ride-hailing service is duking it out for survival. Who can survive subsidizing rides the longest? Seems like a strange move when it’s not even clear that’s a solid business model. I’m just not seeing how it works out. What’ll probably happen is this: more consolidation—Gett just purchased Juno for $200 million, for instance—and a shrunken network for what cities these services are deployed in. And people, many people, will continue to drive.